Compare prices on car hire in Korsika from all the major brands and find the best deals. When you book through us, unlimited mileage and insurance are always included in the price given. Corsica is an island in the Mediterranean Sea, north of Sardinia .The island is divided into two ministries. Haute-Corse and Corse-du-Sud, where the capital is Ajaccio. A total of 272,000 inhabitants live on the island. The distance to the Italian mainland is 80 miles. The ferry to France Nice , Marseille and Toulon , and Italian Genoa , Livorno, Savona, Naples and Sardinia. The island’s population is originally of Italian origin and speak an Italian dialect. So the island belonged to Genoa from the 1300s until it was sold to France in 1768. 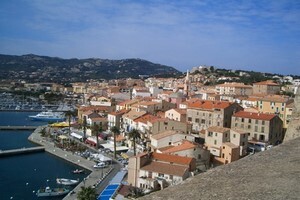 Corsica is perhaps best known as Napoleon Bonaparte’s birthplace. Not least is the island known for its beautiful beaches. Here visitors can dive, sail or sunbathe on the beach. They can also enjoy hiking in the Grande Randonnée-course. It is possible to go on a trip to Sardinia in the south. Corsica has a Mediterranean climate, with an annual mean temperature is 17-18 ° C.
The island has four airports in the cities of Ajaccio , Bastia , Calvi and Figari.